The Film Heritage Foundation saw major success with the 2nd edition of Film Preservation and Restoration Workshop India, 2016. This initiative was taken up in urgent need to preserve India's rich film legacy. So, Viacom 18 came up with this idea and became the principal sponsor of this 10-day workshop that was conducted by Film Heritage Foundation in collaboration with the National Film Archive of India (NFAI) and International Federation of Film Archives (FIAF), which was held at NFAI, Pune. 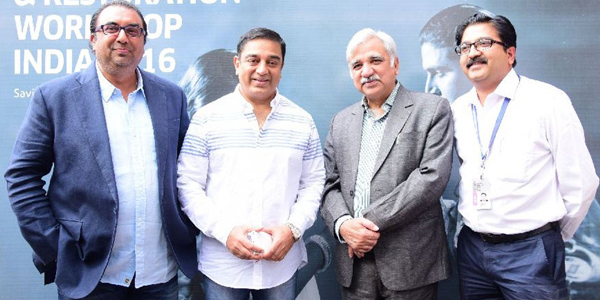 South and Bollywood star Kamal Hassan was the Guest of Honour at the closing ceremony of the Film Preservation and Restoration Workshop 2016. The unique part of this initiative was that it covered the preservation of both film and non-film material like posters, documents, lobby cards, photographs, etc. which are an integral part of our cinematic heritage. Kamal Hassan said, "I am very pleased to be invited to be Chief Guest at the closing certification ceremony of the Film Preservation and Restoration Workshop in Pune and to present the FIAF certificates to the participants. A workshop of this kind is crucial for our country that has lost so much of our cinematic history and we need to grow a resource of passionate film archivists who are committed to saving our cinematic heritage. I would like to congratulate Film Heritage Foundation for this remarkable initiative and for conducting the workshop at the National Film Archive of India."